You know that moment when you spot something so fabulous! - YES! Then there's that moment when you see the price tag, and find that it's way in your budget - YES! Then finally that exhilarating moment when you part with some of your money in exchange for a piece of awesomeness - YES! Well this is one of those moment but 100 times better! 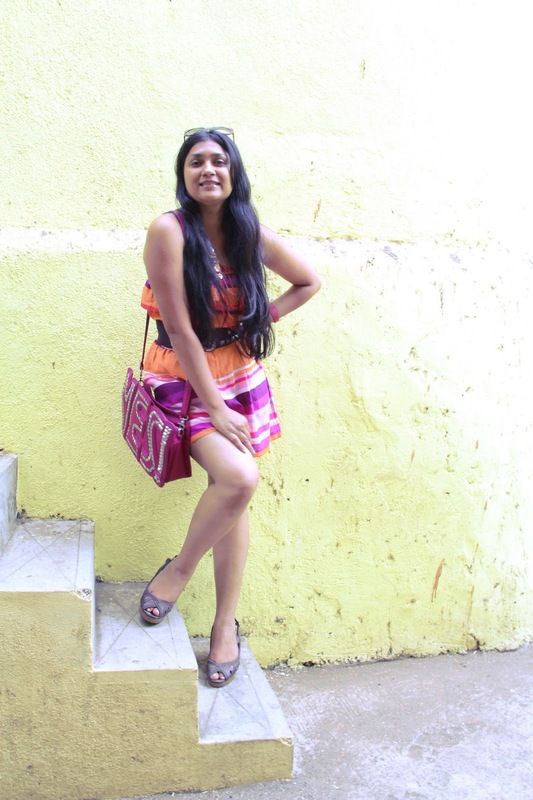 I managed to snag this pretty little bag from a store in Bandra for 500 bucks! Really! Ironically, the bag also says 'YES'. When I first spotted it, I faced those same questions that every 'reformed' shopaholic faces - do I need another bag? Is it worth it? Am I going to use it as much? Will it look good on me? etc, etc..
And all those questions were answered with a very big, pink, over the top, and studded YES! 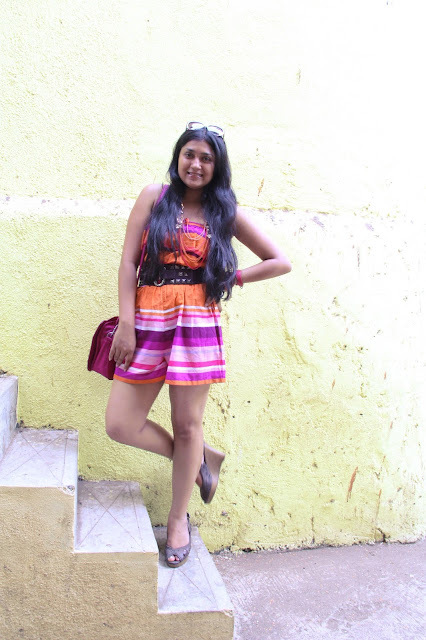 Another awesome buy was this pretty playsuit, all striped, cotton and colorful. And for just 100 bucks! Look who joined me? My sweet little cat, Puchu! Beaded bracelet - Old piece found at home. YOU GOT THAT PLAYSUIT FOR 100 BUCKS? AND THAT BAG FOR 500? I CANNOT STOP SCREAMINNNG. OMGGG. Hey I just met you, and this is crazy, take me shopping maybe? Yes such a lucky find! Well technically a store in Lokhandwala was shutting down and they were selling everything at dirt cheap rates.. If it wasn't during work hours, I would have bought a lot more than just this playsuit.. But had to control. But yes to shopping! Anytime! Hi amazing post! loved the bag!!!!!!! you have mentioned Raju's store (Hill Road) a lot of time, where is this exactly in Hill Road? Ah you have to visit Raju's store! Its in the tiny lane next to Sagar. It's not a store, but just a small jewelry stall on the left. Now there are 3-4 of them, Raju's is the last one. I need a cute little playsuit like that in my life ! That playsuit is just the cutest. It looks great on you. Plus this colour combo suits you real well. Hi! I found you in Chicisimo and I absolutely love your style!! I also have a fashion blog with many readers from all over the world and I would like to upload at least one picture of each country that reads me, one of them is India, of course! So I was wondering If I could use your pictures there :) Here is the link in case you wanna check it. I hope you say yes as many girls have done already. Would be really cool! How your bag could define who you are! Stealing from the kiddie section - Again!